When you tell me that my feminism is of the angry kind, I need you to know that it didn’t start out that way. It isn’t that way at the core. My feminist heart got tired of being battered and broken in a church that promised to love and cherish it. It got tired of being knocked around by the buts and only ifs. We love you Abby, all of you, but only if are a little less loud, only if you are a little less bursting with your ideas. We let you serve in your bold seventh grade way, but only until the boys want to do it. When no one else wants to do it, your desire is from a servant’s heart. When others do want to, you need to learn to submit. In high school you are too close to woman, and them to man, and then your gifts are too loud and too bold. Then it will be their turn, and you will need to sit down. We will love your whole heart, but only if you are willing to submit it to any man who comes up and wants a chance to lead. We will love your whole heart only when no one else volunteers. I know it surprises some when a girl as loud and as occasionally obnoxious as I am is also very sensitive. I know it seems strange that someone who speaks as boldly as I so often do is scared most of the time. But there it is. You see, I am afraid that my sad, crying heart will bleed out one of these days if I let it rattle around in the church. It has gotten hurt there before, I best not leave it out. I am afraid of the mourning clothes, so I clothe my heart in anger. I encase it in anger, so that it will stop bleeding, so this heart of mine won’t stop beating. Like most, I have learned to be more careful with this heart the hard way. When you tell me I have lost the heart of servanthood, am neglecting the heart of submission, the gentle back and forth of a dance led a followed, flowed from the Father, I need you to understand it was only in the submitting I learned to dance at all. It is in my nature to submit, to roll over on my belly and expose my weakest part of myself to you. I’ll even pee a little bit, embarrass myself like a dog trying to declare my undying allegiance to the authority in front of me. When I am asked to pick an animal to represent myself, my patronous, my soul animal, I choose a sheep dog. I am a pack animal, and I am better at rolling over than I would care to admit. We can do it your way. It is fine. Really. I don’t mind. Here’s the thing about sheep dogs: They know who their master is. They know who their flock is and they know who their master is and they care for their sheep as they follow their master. Amidst all the shouting of women and submission I mistook a lot of voices for the voice of my master. I was on my back, legs in the air, belly up to anyone who was yelling. A sheep dog on her back is useless. She cannot care for the things she was designed to tend when she is busy submitting to any voice that she hears. 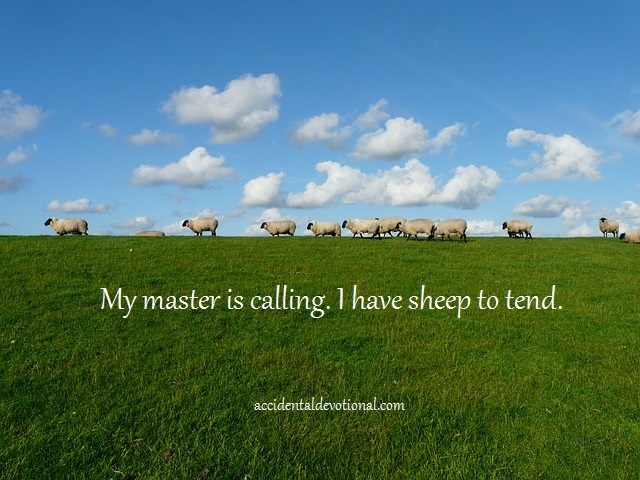 I am learning to heed only the calls of my master, even when others are calling out in his name, “sit!” “stay!” heel!” I can hear his gentle voice, “come, run, tend what I have given you.” Listening to the voices that are not my father often leave me cowering with my tail between my legs. It isn’t always safe, this calling in this body and listening to people who are not my master has only compounded the situation, and left me distracted from my work. When you see me rising from my stance of submission, you need to understand it is the master’s voice I am submitting to. I would never stand up on my own. If it were left up to me I would live my life belly up, legs in the air. It is time for me to use these strong legs, to bark a little bit in a voice that surprises even myself, to feel satisfied when I see that all is well with the flock that is under my care. I need to get out of this loud barn, and go with my master into the wild flower fields. I understand it doesn’t look like submission to you, but it isn’t you I am answering. My master is calling. I have sheep to tend. Damn. I have tears, Abby. This s beautiful. Yeah, it has been sitting on my heart since Wednesday. I cried to my small group talking through all of this! I have wanted to say these things so many times, to so many people. Beautiful, kind response to what was probably a horrible letter. Thank you. I need to know I am not alone. Abby, I’ve read this three times, and I am still lost. What a strangely bizarre article. I know! and then the editor defended it. Weird. Thank you. There are a lot of us hiring, and feeling inadequate, and feeling confused. We have so much freedom in Him. Thank you thank you thank you, sister in Christ! Oh auto correct! Hurting- there are a lot of us hurting! This echoes how I felt as a teenager in church, and explains why I left that particular denomination. Women have gifts outside of serving in the nursery! Well-written. Wow, Abby, AWESOME. You rock in so many ways. I thank God for you. Timely. I am struggling with this even now. Not in exactly the same way as you, and I am not by nature a submissive (to other humans) person. I love your last idea: “I understand it doesn’t look like submission to you, but it isn’t you I am answering. My master is calling. I have sheep to tend.” You hit it out of the ballpark with that one. Thank you. Well I have a whole other post that got edited out of this that my I don’t want to submit script starts with “It isn’t my turn.” So….there is that. “Come, run, tend what I have given you.” Those are so the right words for what’s burned in my belly as well. It resonates with what Elora wrote about the weird feelings you can’t really articulate. We are being called into challenge, into danger, sometimes even into tension. It is possible to be in all those places BECAUSE you are called. I like you so much. You and I are on parallel adventures I think! Abby, this is just lovely. Thank you so much. I could not read that entire article, I just started to cry a little on the inside. And to feel really, really tired. 30+ years I’ve been struggling to the surface of who I am called and designed to be – and I am just plain exhausted by this blow-back. So thank you. I read myself in your words, I truly do. I love so much that your name on here is pastor D T. I know I am not the only one you pastor. Thank you thank you. Oh my gosh Abby. This is so good. So so good. Rejoice in the voice you have been given. Be as loud as necessary, louder even. Your flock needs to hear you. The church is asleep and the sheep who are not of this fold are dying. Thank you. Amen. I am humbled to think of the people who read this as a flock I help keep. My audience is full of amazing souls. Damn this is brave. Preach, girl. Submission all too often is another way of controlling women. God has given women and men so many gifts and strengths, and at times, this may include submitting to one another in love. However, people who have leadership abilities are not threatened by others who also have similar strengths whether they be male or female. God gave each of us the power to be healers in the world, and we need to use this energy to “tend God’s sheep”. Keep struggling with the issue. The answers get easier until its truly no longer an issue at all! Thank you for this encouragment. And for going before me and beating the path and all that. Love this post. We are submitting… to The Master. I have cried too many tears from being put down while following God’s leading me to positions of authority. It wore me out to the point that I don’t want to fight but then I submit again to God and say yes again. You nailed it, Abby, that thing I’ve been wrestling with trying to understand and come to terms with. No more rolling over, lol. Bless you, girl! What a brave, beautiful, and thoughtful post — I applaud you for writing it. As the daughter of an Episcopal priest (who, before she entered into the ministry, taught courses on feminist theology), I can’t tell you how much I love it and completely agree. Brava! Great post! I’ve been reading a lot online lately about this issue. As an Anglican in Canada, this is much less of an issue for us (there have been woman priests since the 70s and the first female bishop was ordained in 1993). It saddens me read about the struggles so many women have when I know so many gifted women priests. Have you read Sarah Bessey’s article http://sarahbessey.com/in-which-jezebel-gives-way-to-deborah/ ? Ironically published the same day as the article mentioned above extolling servanthood. Yes, I did! In fact that post by her probably saved me from collapsing in a heap and declaring that things would never change and I am done. Sarah’s writing has had such an impact on me, my writing, my parenting. So grateful for her. Oh, Abby. I was in that heap until I read your post. The Spirit of God is really moving the hearts of so many women and it’s beautiful how when one loses heart there is yet another to pick us up and gently nudge us forward. Hearing our master’s voice! Then it was my turn sister. Here is my hand. We can do this. I am just short of speechless but I have enough left to whisper a teary “thank you.” Truly. Thank you! It is so important to recognize that God has created each for ‘such a time as this’ , and to not judge. What may look like rolling over and giving in to some may be bravely following the call for others. I praise God for men and women who are seeking the Master’s heart and call. I am so thankful you wrote this!! I just found your blog recently and am loving it. You expressed so beautifully what many of us feel – this resonated with me big time. I was trying to explain this very thing to my husband the other day and while he agrees with me, I did not make my point near as well as you did – he and I both loved this! Thank you for saying something for which I could not find the words. Grateful you are hearing and following our Master’s voice!! Well it started with me a crying and cussing mess at small group. This stuff is hard, and deep and I don’t know that there are words for it always. “We let you serve in your bold seventh grade way, but only until the boys want to do it.” I love this statement. I loved that whole paragraph! Thank you for your words. I’d love to talk with you more about these things. I long to ‘hear’ God’s voice guiding me . Too often I’m caught on the treadmill of good intentions. Runnin faster & faster, looking over my shoulder for God’s approval instead of waiting for God to lead me. That’ll preach. Thank you, Abby. That is my favorite phrase! And YOU told it to me! Thank you thank you thank you. Oh my word! Thank you for writing this. I could not relate more. This is so true and brave and beautiful that it cut through all my jealousy issues (about other people writing so well 🙂 ). I don’t wish I had written this, because I needed it too much. I needed to read these words from you. Actually, ok. Not I am rereading this and it brings me to tears. These words were for me, my friend (sorry everyone else). I have been wrestling hard with the tension between wanting to just roll over and the quiet, constant call to stand up. Those other voices are so convincing – so convinced of their own leadership gifts… So sure of they are the master. They say they hear Jesus. They say they hear Jesus clearer than I do and I easily become convinced that it’s true. I go passive. Submit. On the extreme side, it’s like some kidnapper saying “Your mom told me to pick you up from school. She wants you to come with me.” WAIT. My mom didn’t tell me that! Why am I believing these voices more than I do. The Master will speak and I can hear. “Come. Run. Tend.” And I will speak in a voice that surprises even myself. Wow. I haven’t been involved in an “evangelical” or more traditional church setting in a long time. I thought attitudes had evolved in the last 20 years, but I must be sadly mistaken. I thought it was just a few of the more misguided “entitled” (sometimes pastors or priests) who assumed women or those less powerful were there to cater to their whims. Your voices are sorely needed for as long as you can take it. When and if you can’t take it any longer or don’t want to subject your families to twisted interpretations of God’s word, consider trying the Unity Church. Not every church treats women in this manner. A safer and more joyful society is dependent on this cultural paradigm shift.